Beds were comfy, room quiet, reception very helpful and changed our room from queen to king at our request without a wince or blink of an eye and very friendly. Where to find Ivy Lea hotels near an airport? 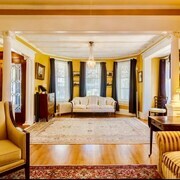 Where can I find hotels in Ivy Lea that are near tourist attractions? 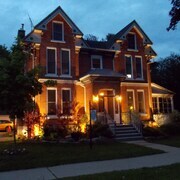 Planning to spend some nights in Ottawa - Southeastern Ontario? Hoping to find a hotel in or near Ivy Lea? Within a 0.1-kilometre (0.06-mile) distance from central Ivy Lea you'll find 3 Expedia-listed short-stay and long-stay accommodation options you can choose from. The Capricorn Motel Royale Thousand Islands is one of the most convenient hotels as it is one of only a small number of options within an easy stroll of the Ivy Lea downtown area. 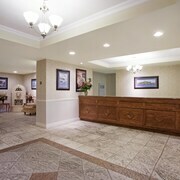 The Holiday Inn Express Hotel & Suites Gananoque is located 11 kilometres (7 miles) from the middle of Ivy Lea. 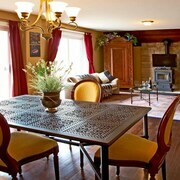 Alternatively, the Country Squire Resort is positioned 11 kilometres (7 miles) away. Other options around this area are the Quality Inn & Suites 1000 Islands and the Travelodge Gananoque. Once you have explored Ivy Lea, you should make time visit the other natural and cultural attractions of the Ottawa - Southeastern Ontario area. Check out Ottawa - Southeastern Ontario's old towns, art museums and nature museums or enjoy the area's forests and rivers. In this section of Canada tourists may partake in cross-country skiing. 60 kilometres (37 miles) to the north of Ivy Lea you will find Smiths Falls, where you can find Heritage House Museum and Rideau Canal Museum. If you'd like to visit Smiths Falls, check Expedia's booking pages for the latest deals at the Econo Lodge and Best Western Colonel By Inn. 40 kilometres (25 miles) to the west of Ivy Lea, you can also stay at Kingston, which is home to the Residence Inn Kingston Water's Edge and Delta Hotels by Marriott Kingston Waterfront. The Queen's University and Fort Henry are some of the most popular points of interest to explore while in Kingston. Get your sports fix by making a trip to George Taylor Richardson Memorial Stadium, which is 45 kilometres (26 miles) to the west of Ivy Lea. Book accommodation close to the action at the Holiday Inn Kingston Waterfront or the Holiday Inn Express Hotel & Suites Kingston. Thank you for taking the time to explore our Ivy Lea accommodation page. Do yourself a favour and visit our Ivy Lea travel guide for the inside scoop on this area's many things to see and do. What are the most popular Ivy Lea hotels? Are there hotels in other cities near Ivy Lea? 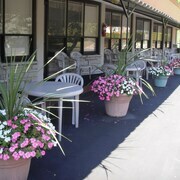 What other types of accommodations are available in Ivy Lea? 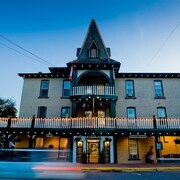 Explore Ivy Lea with Expedia.ca’s Travel Guides to find the best flights, cars, holiday packages and more!